I’ve entered a phase of experimental gardening with fabric pots. Right now I think these things are the greatest idea ever. I’ve wanted raised beds but haven’t had the time to create any so little bags to hold dirt is the closest I’ve come. 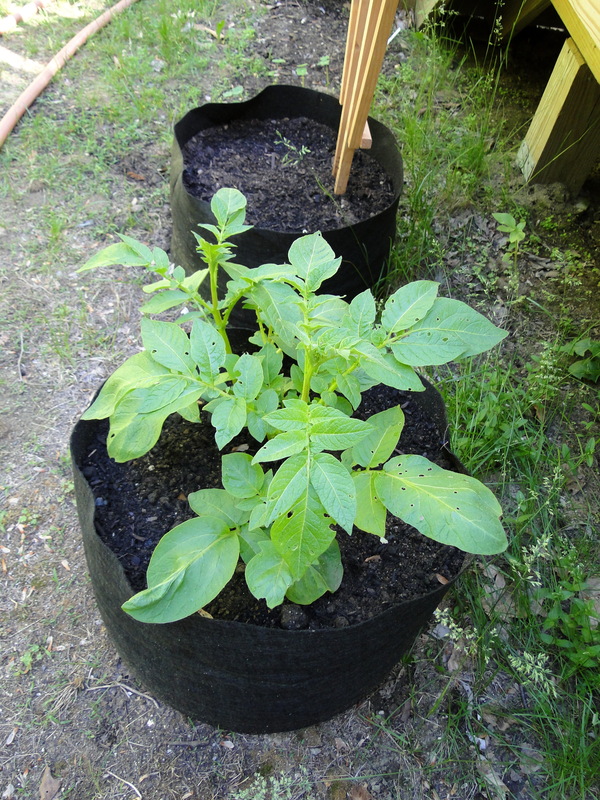 I planted two pieces of potato in this bag a few weeks ago and as you can see, they are growing nicely. I am going to admit that I am a dummy when it comes to potato growing. I always thought the potatoes grew off the roots, but I guess they grow from the stem as it shoots upward. I do know that when the tops die, it’s about time to harvest the potatoes. This page at the Food Gardening Guide site has a good explanation of what to expect when growing potatoes. Next year I will get my potatoes planted earlier as they like the weather cool. I hope this fabric pot works out because it is certainly an easy way to grow them. Next to the potatoes I have planted some green beans that haven’t sprouted yet. On the other side I have one more pot where carrots are sprouting. Another plus to using these pots, for me anyway, is that my cats stay out of them. I wondered about that, since they seem to think my gardens are the best place to do their business. I was hoping they wouldn’t think a pot of dirt was their litter box. Next you will have to see my large fabric garden. It’s like this potato holder, but much bigger. I’m planting my garden in pots this year. It makes gardening a lot easier. Once I run out of pots, I’m going to try the fabric pots. I bet those potatoes are going to taste good.